People take part in the Gay Pride Parade on Istiklal Avenue in Istanbul on Sunday. Istanbul, Turkey (CNN) -- Thousands of Turks marched through Istanbul in a demonstration calling for improved rights and greater social acceptance for the country's homosexual community. Activists say the annual Turkish Gay Pride Parade, now in its ninth year, is the only march of its kind in a majority-Muslim country. Several thousand supporters of lesbian, gay, bisexual and transgender rights carried signs and rainbow flags as they made their way down one of Istanbul's busiest pedestrian thoroughfares. Participants chanted slogans against harassment and blew whistles, waved large rainbow flags and carried signs in Turkish and English that sported messages like "We're everywhere, get used to it" and "Dance, dance, against homophobia, dance." Other signs referenced Ahmet Yildiz, a 26-year-old who was shot to death in Istanbul in 2008. Yildiz's father has been accused of traveling almost 600 miles to shoot him in what has been called an "honor killing." According to Yildiz's partner, Ibo, Yildiz sought protection from prosecutors after receiving threats of violence from his family. His case was featured in an Amnesty International report on the status of gays, lesbians, and transsexuals in Turkey entitled "Not An Illness, Nor A Crime." The report says it later emerged that the prosecutor's office erroneously transferred the complaint to another office and failed to investigate the claims, in what some activists view as the unwillingness of the authorities to confront homophobic violence. Sunday's march blurred ethnic and religious lines. A group of about 20 Kurdish activists, fleeing police tear gas that was fired at an unrelated nearby political demonstration, were greeted by a round of applause as they joined the colorful crowd. Tear gas from the same demonstration wafted over parts of the crowd, causing the march to stall briefly as people took cover to stave off its effects. Gay rights organizations have accused Turkey's government of expressing hostile attitudes toward the country's homosexual community. Activists point to a statement made by Aliye Kavaf, Turkey's minister for women and family affairs. "I believe homosexuality is a biological disorder, an illness, and should be treated," she said in a 2010 interview with the Turkish newspaper Hurriyet. One parade-goer, who was a part of a tango group moving through the crowd, wore a bright red head scarf with a checkered red, black, and white tie as she danced with her partner. The dancer, who wears a head scarf in daily life, said that Islam and homosexuality are not incongruous. "Religion is not a fixed thing," said Iz, who declined to provide her last name. "It has been interpreted throughout history, is still being interpreted and it needs to evolve." 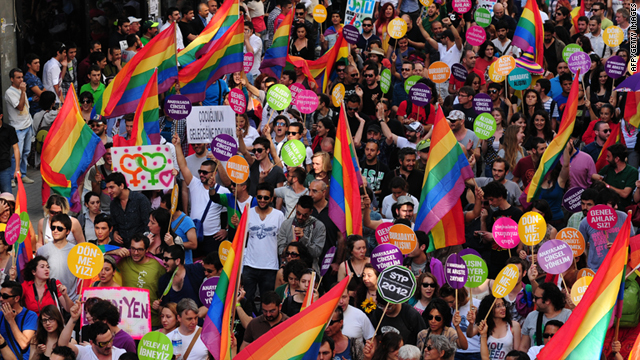 In accession talks with the European Union, Turkey has been gradually improving its record on homosexuality as it makes changes to conform to EU policy on human rights laws. Many marchers on Sunday came out to improve social consciousness of homosexuality. "The big-bellied, mustached men are looking, trying to figure out what's going on. They're learning what a rainbow is," said Natalie Aslan, 23.